Enter to win a pair of passes to see GET OUT in Orlando! You can win an admit two pass to see the new movie GET OUT at AMC Altamonte Mall 18 - 433 E. Altamonte Drive, Altamonte Springs, FL 32701, on Tuesday, February 21st at 7:30pm. 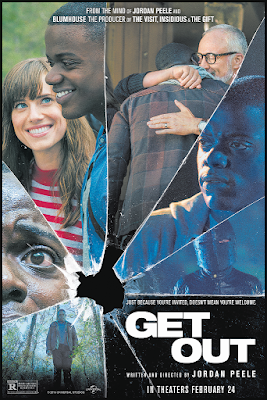 In Universal Pictures' Get Out, a speculative thriller from Blumhouse (producers of The Visit, Insidious series and The Gift) and the mind of Jordan Peele, when a young African-American man visits his white girlfriend's family estate, he becomes ensnared in a more sinister real reason for the invitation. At first, Chris reads the family's overly accommodating behavior as nervous attempts to deal with their daughter's interracial relationship, but as the weekend progresses, a series of increasingly disturbing discoveries lead him to a truth that he could have never imagined. Equal parts gripping thriller and provocative commentary, Get Out is written and directed by Peele (Key and Peele) and produced by Blumhouse's Jason Blum, as well as Sean McKittrick (Donnie Darko, The Box), Edward H. Hamm Jr. (The Box, Bad Words) and Peele. The film also stars Caleb Landry Jones (X-Men series), Stephen Root (No Country for Old Men), Milton "Lil Rel" Howery (The Carmichael Show), Betty Gabriel (The Purge: Election Year), Marcus Henderson (Pete's Dragon) and Lakeith Stanfield (Straight Outta Compton). GET OUT opens in U.S. theaters on February 24th, 2017.
a Rafflecopter giveaway Disclaimer: NO PURCHASE NECESSARY. Limit one (1) admit-two e-pass per person. This film is rated PG-13. Must be 13 years of age or older to win passes. Employees of all promotional partners and their agencies are not eligible. Void where prohibited. Entries must be received by the contest end date to be eligible to receive pass. Winners will be contacted via e-mail to receive their e-pass. Sponsors not responsible for incomplete, lost, late or misdirected entries or for failure to receive entries due to transmission or technical failures of any kind. SEATING IS LIMITED, SO ARRIVE EARLY. PASS DOES NOT GUARANTEE A SEAT AT THE SCREENING. Refer to screening pass for further restrictions. ONE ENTRY PER PERSON.